McGanniversary Week: THE ZYGON WHO FELL TO EARTH Review | Warped Factor - Words in the Key of Geek. Tony palpates his engorged cybernetic dugs, because it’s Skarasen-milking time. There has been a trend in New Who to deepen and complicate the moral landscape of Classic Doctor Who villains – we’ve seen inside the mind of Daleks both ‘faulty,’ meaning they had a conscience and a sense of wonder, and ordinary, Clara Oswald realising that the impulses to say or feel anything other than Dalek supremacy and hate are turned towards those goals, that fear, claustrophobia, helplessness and hysteria are as much a part of the Dalek psyche as supremacy and a gun-stalk. We’ve seen the horrifying truth inside the Cybermen, that every single one of the metal monsters is a victim, a you or me turned hideously against everything we’ve ever known and loved and cared about. But where there’s been no metal involved, no programming for uniformity, the complication and deepening has worked for the most part on species where a philosophical ambivalence was built in to their original appearances. The Ice Warriors, cast in New Who as a proud and noble race, had for the most part evolved from their Troughton debut stories as stompy monsters into the Pertwee years when they were peaceful members of a federation of planets, only occasional radical handfuls still committed to war. The Silurians too always had lively and vivid debates about the right way to deal with the situation in which they found themselves, Ichtar’s revolution in Warriors of the Deep acting as the same kind of rogue group. The same can’t be said for the Zygons. The Zygons only had one appearance in Classic Who, and they were a small, isolated band who had nothing but enmity towards the human race, so it was easy for both us and the Doctor to imagine the Zygons in a broad way, all thinking the same. Their appearance in the fiftieth anniversary special did them very little good in that regard either – they snarled, they smashed things, they hatched evil plots and then they were largely superceded by events. But one crucial thing in The Day of The Doctor was the Time Lord’s determination that there should be no ‘You’re all doomed by your intention to invade’ solution. No, rather than treating the Zygons as irredeemably hostile, the Doctors engineer a solution that sees the humans and the Zygons forced to negotiate a mutually beneficial treaty – a solution which leads us to a far greater understanding of the divergence of opinion in Zygon society in The Zygon Invasion/The Zygon Inversion in Series 9. The point of all of which is to say that for the most part, the idea that the Zygons might be anything other than a gang of aggressive invaders wanting to do unspeakable things to our planet never occurred to the on-screen Doctors until it had been thoroughly road-tested in other media. Step forward Paul Magrs, road-tester extraordinaire, who can always be relied upon for an unusual take on things and who should really get some of the credit for the Zygon rehabilitation, having written The Zygon Who Fell To Earth back in 2008, perfectly capturing this spirit of Zygon discord and individuality long before it ever appeared on-screen. The premise is simple – a Zygon commander, Warlord Hagoth, came to Earth with his band of big red rubbery things covered in suckers, but then took a human form, released a hit record or two (as you clearly do if you’re an alien newly arrived on the planet), and fell in love with a human woman – Pat Ryder. Renouncing his warlike Zygon past, he settled down to run a guest house with her, wanting nothing more than to live out his life with the woman he loved. But then, twenty years later, his Zygon crew come looking for him, determined to get back to business as usual. Magrs had been responsible for the second adventure for the Eighth Doctor’s second great companion, Lucie Miller, and it had kickstarted what can loosely be thought of as ‘The Aunty Pat Trilogy.’ When Lucie runs into a young version of her aunty in a motorway service station in 1974 in Horror of Glam Rock (pure class, that title), it begins a sequence of events than run through the three stories. Still new to the time travel game, Lucie carelessly blurts out to the young Pat Ryder that she’s ‘nothing. Well, nothing special’ in the future, when Lucie knows her as her favourite aunty. The Zygon That Fell To Earth takes us into a part of Pat’s life that she’s never mentioned to Lucie, when she runs the ‘Bygones’ guest house in 1984 with her ex-pop star husband, Trevor. Except clearly, as of 1984, they’re not all like that any more. With explanations coming about the real, honest love between Auntie Pat and her ‘great big hunk of Zygon,’ and the nature of the ‘real’ Trevor whose body-print Hagoth has been using all this time, the Zygons become, in front of our ears, a more complex species than they’ve ever been before, capable of individuality and divergence of opinion. As Urtak and the crew try to force Hagoth’s hand though, there are dues to pay, and after standing their ground to defeat Urtak’s attempt to fire the Zygon missiles on board Hagoth’s command ship, neither Pat nor ‘Trevor’ will ever be quite the same again. Crucially, Lucie doesn’t find out the truth about what happens, and at the end of The Zygon Who Fell To Earth, Hagoth and the Doctor conspire in a comforting lie to keep her safe from some knowledge that would undo everything she thinks she knows about her relationship with her favourite aunty. It’s a lie that will come back to haunt them all in the third story of the Aunty Pat trilogy, Death In Blackpool. 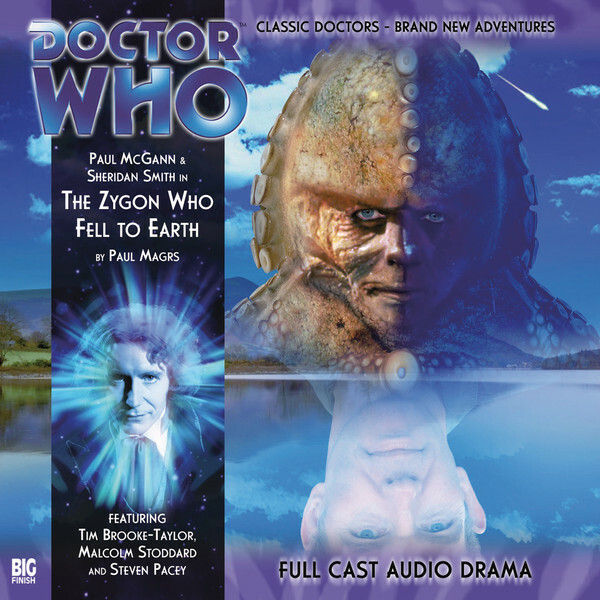 While there’s a fine blend of comedy and drama in most Paul Magrs scripts, of the three Aunty Pat stories, The Zygon Who Fell To Earth is the one that leans furthest into the province of comedy – perhaps unavoidable when you cast Tim Brooke-Taylor as a lovesick Zygon – but it’s also probably the boldest in terms of advancing the mythology and complexity of one of Classic Who’s greatest one-shot villains. With Steven Pacey (Tarrant from Balke’s 7) as Trevor/Hagoth, and Katarina Olsson (more famous for her role as The Headhunter) as Grakus (or Zygon Ringo, if you prefer), the cast is well balanced to keep the storytelling light, the humour genuinely funny, while never shying away from the seriousness of both the themes and the eventual events that consume the Bygones guest house. What The Zygon Who Fell To Earth does most importantly is allow the Zygons to be a fully realised race for almost the first time in Who history, showing the kind of disagreements, and the alternative futures for their species, that races like the Ice Warriors and the Silurians were allowed to have back in the seventies. The Eighth Doctor, perhaps unlike some of his predecessors, is able in Magrs’ hands to shake off his prejudices and tunnel visions about the evil aliens he’s defeated before, and it wouldn’t be too much of a stretch to see a line stemming from the inspiration of The Zygon Who Fell To Earth to the complex political thriller that was The Zygon Invasion/The Zygon Inversion in Series 9 of on-screen Who.